The Women’s Basketball Final 8 Presented by COMDA.COM this weekend (hosted by the Ryerson Rams at the Mattamy Athletic Centre in Toronto) saw the second-seeded McMaster Marauders defeat the top-seeded Laval Rouge et Or 70-58 in the gold-medal game Sunday to claim the Bronze Baby trophy. This was the Marauders’ first appearance in a national final in women’s basketball; their previous high-water mark was a bronze medal in 2007-08. 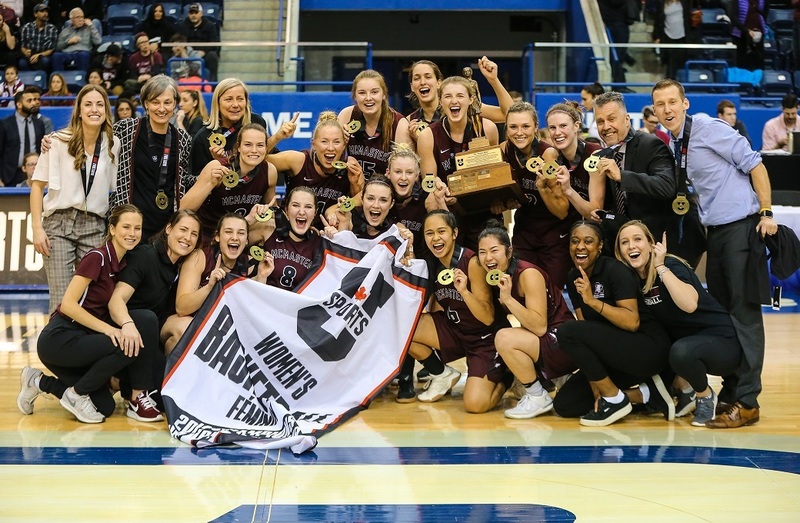 But this time around, head coach Theresa Burns (in her 26th season at the helm) led McMaster to a national gold, and she spoke afterwards about what a challenging journey it had been for her team. A full recap of the championship game can be found here. The Guelph Gryphons are again back on top of the U SPORTS track and field world. 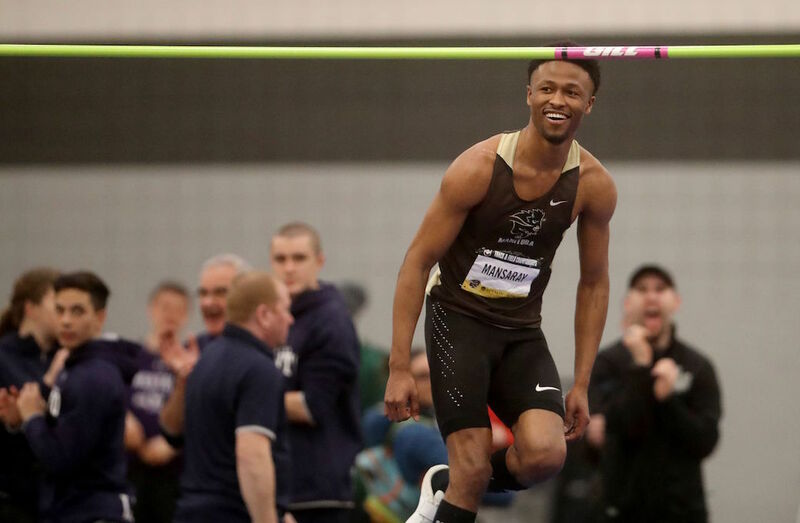 The Manitoba Bisons hosted this year’s U SPORTS Track and Field Championships Presented by Beynon Sports at the James Daly Fieldhouse in Winnipeg, and the Gryphons earned both the men’s and women’s titles for the second consecutive year. The Guelph men won their third-straight title, posting 123 points (followed by the University of Toronto Varsity Blues with 72 and the host Bisons with 60.5), while the Guelph women won their second title in a row, recording 139 points (followed by the Saskatchewan Huskies with 99 and the Western Mustangs with 57). The Gryphons’ Jenna Westaway was named female athlete of the meet with three golds (in the 1500 metres, the 1000 metres and the 4X800-metre relay), while the York Lions’ Pierce Lepage was named male athlete of the meet with a gold (in the 60-metre hurdles), a silver (in the 4X200-metre relay) and a bronze (in high jump). A full recap of the championships can be found here. Speaking of sustained success for the Gryphons, their No. 4 women’s hockey team found some of that as well this weekend, taking down the No. 8 University of Toronto Varsity Blues 4-2 Saturday to claim the McCaw Cup as OUA champions. That was Guelph’s third OUA title in the last four years; they previously won in 2016 and 2017 (the Western Mustangs beat the Queen’s Gaels in the final last year). This came after Guelph downed the Ryerson Rams in one semifinal last weekend, while the then-unranked Varsity Blues edged the then-No.8 Mustangs in the other semifinal. Saturday’s McCaw Cup game in Guelph saw Toronto strike first, with Kassie Roach scoring at the 11:50 mark of the first period. Gryphons’ forward Claire Merrick responded just over two minutes later, but Roach added another goal in the second to give the Varsity Blues a 2-1 lead. In the third, though, Guelph did all the scoring, with Katie Mikkelsen tying the game in the first minute with power-play goal, Kristen Jay giving the Gryphons the lead just over seven minutes later, and Merrick adding an insurance marker inside the final three minutes. Mikkelsen assisted on the last two goals, while Valerie Lamenta made 16 saves for the win. The Gryphons have been seeded third in the upcoming 2019 U SPORTS Women’s Hockey Championship, which the UPEI Panthers will host this week at MacLauchlan Arena in Charlottetown. The Varsity Blues will be there as well, seeded eighth. The other teams there in order of seeding are the Alberta Pandas (No. 1 in the latest Top 10 rankings, Canada West champions), the Montreal Carabins (No. 2, RSEQ champions), the St. Thomas Tommies (No. 5, AUS champions), the McGill Martlets (No. 6, RSEQ finalists), the Manitoba Bisons (No. 4, Canada West finalists), and the UPEI Panthers (unranked, AUS quarterfinalists/hosts). A full championship preview can be found here. Over in men’s volleyball, there’s a new OUA team on top. The Queen’s Gaels hosted the Final Four championships this weekend and beat the No. 5 McMaster Marauders 25-19, 19-25, 23-25, 25-16, 15-13 Sunday to claim their first Ontario title since 2011. Last year, McMaster hosted the championships and beat Queen’s in straight sets in the final to clinch their sixth title in a row, the longest streak in OUA men’s volleyball history, but the Gaels were able to get some revenge on home court this year, claiming the Forsyth Cup in front of 1,441 fans. Queen’s came out hot on Sunday, picking up a 16-10 lead and then cruising to a 25-19 first-set victory. But the Marauders responded by winning the second and third sets, including a rally to overcome a 16-11 Gaels’ lead in the third. Queen’s took the fourth set handily, but had to battle in the fifth, recovering from a 9-8 deficit to win the championship on a kill from Joel Rudd. Adam Boljkovac led the way for Queen’s with 22 kills, while Rudd had 19 kills, two blocks and an ace and Zac Hutcheson had 18 kills, two blocks and 12 digs. Setter Zane Grossinger had 64 kills and five blocks for the Gaels. Meanwhile, Matt Passalent had 22 kills and nine digs for the Marauders. After the match, first-year Queen’s head coach Gabriel deGroot was excited about how his team came together. The Gaels are now off to the 2019 U SPORTS Men’s Volleyball Championship Presented by Hôtel Universel Quebec, hosted by the Laval Rouge et Or at the Amphithéâtre Desjardins-Université Laval in Quebec City. Queen’s will be seeded sixth there, while McMaster will be seeded seventh. The other seeds in order are the Brandon Bobcats (No. 1 in the last Top 10 rankings, Canada West champions), the Trinity Western Spartans (No. 2, Canada West finalists), the Rouge et Or (No. 3, RSEQ champions/hosts), the Mount Royal Cougars (No. 4, Canada West semifinalists/at-large berth), the Alberta Golden Bears (No. 6, Canada West semifinalists/at-large berth), and the Montreal Carabins (RSEQ finalists). A full preview of the championships can be found here. Speaking of the Gaels, they came up with an impressive win on the hockey side this weekend as well. The No. 6 Queen’s men’s hockey team beat the No. 5 Guelph Gryphons 4-1 at home Saturday in front of a sold-out crowd of 2,800 fans at Kingston’s Memorial Centre. That meant the Gaels picked up their first OUA championship since 1981, claiming the Queen’s Cup (which the school donated back in 1902-03). Jaden Lindo opened the scoring for the Gaels on the power play 22 seconds into the second period, but Marc Stevens equalized for Guelph just before the end of that frame. However, the third period saw Lindo score his second of the game before further goals from Henry Thompson and Liam Dunda (the latter into an empty net) secured the win. Justin Fazio made 31 saves for Queen’s. The Gaels will now head off to the 2019 U SPORTS Cavendish Farms University Cup, which the Lethbridge Pronghorns will host this week at Lethbridge’s ENMAX Centre. Queen’s is seeded third overall at nationals, with Guelph seeded fourth. The other seeds in order are the Alberta Golden Bears (No. 1 in the latest Top 10 rankings, Canada West champions), the UNB Reds (No. 2, AUS champions), the Saskatchewan Huskies (No. 3, Canada West finalists), the St. FX X-Men (No. 4, AUS finalists), the Carleton Ravens (No. 8, OUA bronze medalists), and the Lethbridge Pronghorns (Canada West quarterfinalists/hosts). A full championship preview can be found here. The Canada West women’s volleyball championships this weekend saw an upset in terms of the Top 10 rankings, with the No. 6 Trinity Western Spartans defeating the No. 2 Calgary Dinos in straight sets (25-14, 25-18, 25-15) on the road Friday to win their third title in five years. Setter Brie King was named the player of the match for Trinity Western, recording 32 assists and two service aces, while Savannah Purdy had a match-high 10 kills and Hilary Howe had nine. Kenzie Vaandering had eight kills for the Dinos. The OUA championships also saw a big upset, with the No. 8 University of Toronto Varsity Blues downing the No. 1 Ryerson Rams in straight sets (25-20, 25-21, 25-21) to claim their first Quigley Cup since 2016. Alina Dormann posted 17 kills and an ace and was named player of the match for Toronto. Anna Feore added 10 kills, 2.5 blocks and two aces, while Jenna Woock had seven kills, three aces and a block. Your 2018-19 OUA Quigley Cup CHAMPIONS!!!! Toronto sweeps Ryerson 3-0 (25-20, 25-21, 25-21) to win their first OUA title since 2016!!! All these teams are headed off to the 2019 U SPORTS Women’s Volleyball Championship, hosted by the Alberta Pandas at the Saville Community Sports Centre in Edmonton. The Spartans and Varsity Blues will be seeded first and second respectively, while the Dinos and Rams are seeded third and sixth respectively. The other teams there (in seed order) are the Dalhousie Tigers (No. 3 in the latest Top 10 poll, AUS champions), the Montreal Carabins (No. 9, RSEQ champions), the Pandas (No. 7, Canada West semifinalists/hosts) and the UBC Thunderbirds (No. 10, Canada West semifinalists). A full championship preview can be found here. 3rd 🇨🇦🏅 of @Krasnoyarsk2019 ! Meanwhile, Wrestling Canada Lutte announced that Brock’s Samantha Romano (the 2018 Junior Canadian Champion at 50 kg and 2018 U SPORT runner-up at 48 kg) has been selected as the recipient of the Bob McLeod Scholarship for the 2018-2019 academic year. U SPORTS alumna Brigette Lacquette (from the Manitoba Bisons) is on that team, as are Ann-Sophie Bettez and Mélodie Daoust (both from the McGill Martlets). Daoust is also currently an assistant coach with the Montreal Carabins, and the team also includes Marie-Philip Poulin and Natalie Spooner, who have skills coach/player mentor roles with the Martlets and the UOIT Ridgebacks respectively. The first Green Shirt Day will take place on April 7, the one-year anniversary of Boulet’s death. More information is available here.